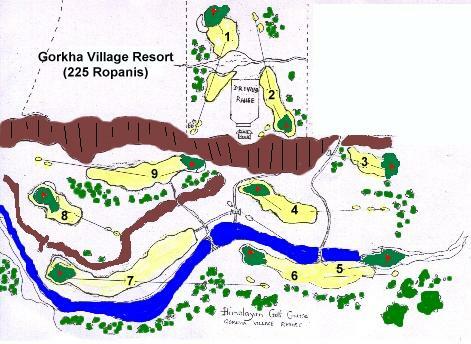 Just 7 kilometers from the center of Pokhara city is the recently completed pro-championship designed 9 holes golf course which is located in a spellbindingly beautiful amphitheater like setting of a river canyon scene with a breathtaking panoramic view of the Annapuma Himalayan range. The Club house is perched on the edge of balcony land 250 feet above the river canyon from where you have a bird eye view below of the golf course with scenes of stunning canyon walls dotted with eagles nest, waterfalls. 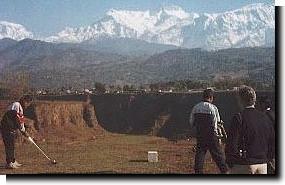 and the soothing sight and sound of the Himalayan snowfed river meandering through the golf course. Golfers will find the course challenging and invigorating to play on. The course has been designed and constructed by an Ex British Army Sandhurst Commissioned Officer Major RB Gurung MBE, who was exclusively invited to take up the challenge to carve a 9 holes Golf Course from what was previously a desolate wasteland of river boulders and swamps. The result of three years of planning, hardwork and dedication has resulted in the creation of an extraordinary course that is not only considered to be most unique in the world but also challenging for all levels of golfers. 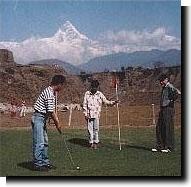 Says major Ram, "It's been my goal to preserve the natural environment so you can experience the beautiful and inspiring Nepali scenery while at the same time playing a challenging round of golf. The enchantment of this course has to be experienced to be fully appreciated. The golf course is 3400 yards from the championship tees. 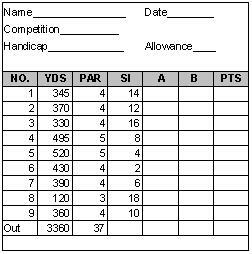 The course incorporates a full range ~shot values to test playing skills. and incorporates such Scottish-influenced features as fairway mounding, split fairways and the use of natural landforms and nature to shape the course. Members and guests' prepare for the demands of HGC on a practice range that is designed to parallel the challenge of the course. Golfers at HGC will meet such features as an island fairway, a ravine, a large island hole encircled by' boulders and water, 30-70 foot elevated hillside tees. 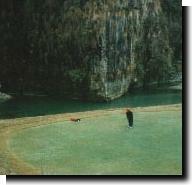 and a hauntingly beautiful canyon amphitheater scene. Pokhara is blessed with a very pleasant subtropical climate. Winters are mild with clear visibility, while the summers are an average of 27°C, with evening showers bringing the temperature down immediately Golf can, therefore, be played throughout the year. When temperatures in Northern Europe fall below freezing. Pokhara experiences a very playable temperature of around 12°C. 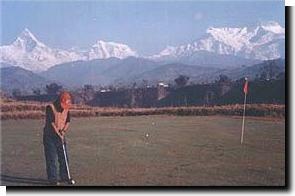 Likewise when the heat hits 45°C in Delhi, Pokhara has a comparatively agreeable temperature to play golf in. After playing this excellent course, golfers can relax at the clubhouse with huge verandas all round, reminiscent of a typical tea plantation manager's bungalow in Assam of India. SOCIETIES: 6 FOR THE PRICE OF 5 GREEN FEES.